Much like the actual show itself, people seem to love or hate the Duggars’ family recipes — there’s no in-between. From time to time, the Duggars will post a recipe on their family’s blog. They’re usually pretty simple, the sort of foods you would expect an enormous family on a budget to eat. But (if you’ve ever been on the internet before) it should come as no surprise that some people have taken it upon themselves to lecture the Duggars on nutrition, how to feed their kids and how terrible in general they and their recipes are. This is the 4th recipe I’ve read and really, they all sound horrible and horribly unhealthy. If you need to resort to all of this salty, fatty, highly processed foods because you have such a large family, perhaps you had too many kids. Jill should start doing missionary work. Sharing recipes is usually the last thing on someone’s mind while taking care of the poor. Unhealthy much??? First tater tot casserole then spaghetti pie? And Jill wonders why she can’t loose her baby fat? Nothing but carbs and empty calories on a daily basis. These comments go above and beyond recipe critique, attacking the family’s parenting, religious devotion and work ethic, with a healthy measure of body-shaming thrown in, to boot. As the recipient of some bizarrely hostile online comments posted to a few food articles I’ve written, I must say it’s jarring to see how terrible people can be when you’re writing about something as innocuous as what to make for dinner this week. I made this and my family loved and to this day I make it all the time. Thank you for this wonderful recipe it got my 6 year and 4 year and 2 year old to Eat. I’ve made this recipe several times since Jill first posted it & it was sooo delicious that it’s now part of my permanent recipe collection. It seems the people commenting positively are facing the same obstacles as the Duggars. They’re trying to feed a family — often multiple kids with different likes and dislikes — something filling, inexpensive and easy to make. These recipes hit the nail on the head. The reality is that foods like pasta, processed cheese and canned “cream of” soups are cheaper per calorie than vegetables and whole grains. Have you seen what a bag of quinoa costs these days? It’s hard to justify buying a $7, 8-ounce bag of ancient grains when you have hungry mouths to feed and can get 7 pounds of pasta for the same amount of money. 1. Swap plain pasta for whole-grain pasta. It’s only a little more expensive, and when it’s on sale, it’s usually the same price as refined white pasta. 2. Look for low-sodium options. Canned soups and jarred sauces can have a lot of extra salt, but low-sodium options are usually available. That way, you can taste your dish and add extra salt only if it’s needed. 3. Look for low-sugar. Lots of canned, jarred and boxed foods are loaded with sugar to make them palatable. Look carefully for low-sugar sauces, cereals and nut butters — you may be surprised at how tasty and affordable these options still are. 4. Add some veggies. Spaghetti pie becomes a lot more nutritious when you use whole-grain pasta and add a few handfuls of spinach or some sautéed bell peppers and onion. If you live far from a grocery store and keeping fresh veggies on hand isn’t an option, then go with frozen. They’re preserved at the peak of freshness and can add tons of flavor to your food. Get a few bags of different frozen vegetables to throw into casseroles, soups and stews. You can even add a cup or two of frozen veggies to your slow cooker during the last 30 minutes of cooking to add more vitamins and fiber to your favorite meal. 5. Buy in bulk. You can buy brown rice, dried beans (which are super easy to make in the slow cooker), whole-grain pasta and more in bulk sizes that will help you save money in the long run. Having these nutritious, filling ingredients on hand will make it easier than ever to cobble together a healthy meal. 6. Take baby steps. If you’re not ready to give up all your favorite foods and change your family recipes, try committing to one night a week where you experiment with a new meal. Enacting a Meatless Monday is a great way to save money (meat is quite expensive, after all) while trying out new recipes that feature vegetables you may not have tried before. 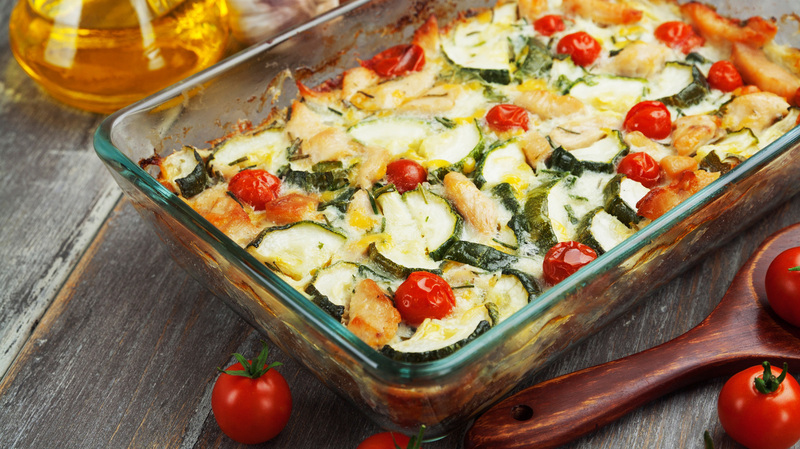 Using these tips, you can have the best of both worlds: the classic, easy, comfort food recipes you love, with the added nutritional value you and your family need.